I miss the sounds of children playing outside in the neighborhood. There are many kids in our neighborhood, but few venture outside to play anymore. I suspect a good number are indoors playing video games or watching movies. Give your kids access to non-stop entertainment, and you might begin to miss the sounds of children playing inside the house too. Sure, it may be easier to let them play the DS all day long (our son thinks “DS” stands for “Dumb” and “Stupid”, since that’s what playing it too much will make you). But don’t you want to play with your kids? 1. Instead of watching a movie, create your own movie story. Here’s what you do. In five minutes, organize the toys with your child. Pick out two or three main characters. Always have a superhero waiting in the wings. Use a toy house, a toy jungle, or some as a backdrop for the action. Have a plane, a rocket, or some mode of transportation. If you need a flood, have blue sheets nearby. Just look at what you’ve got and get ready for a Story. You don’t have to plan the whole story out. “The Wardrobe” – from The Lion, The Witch, and the Wardrobe. The more you use the same playlist, the more familiar you will be with the music. You can anticipate the musical cues, and begin to play with the toys accordingly. Some of the music is mysterious and filled with wonder. Other parts sound suspenseful and would make good background music to a thrilling chase or battle. The beginning of “Aslan’s Camp” right after “Prince Caspian Flees” is perfect for a stunning entrance from a super-hero to save the day. We’ve made these playlists from more than a dozen movies. The music makes the playing much more exciting, and it gives you a creative way of adding drama to the story. Try it. It’s fun. 2. Instead of playing Mario, let your son beMario. Lob plastic balls at him as if they were fire balls keeping him from getting to the end. At the end, give him three pillows, and be the big Bowser that is trying to stop him. He has to hit you three times. You have ammo (pillows) to throw at him too. It’s fun to do this on the sidewalk too, using chalk to create an obstacle course. 3. 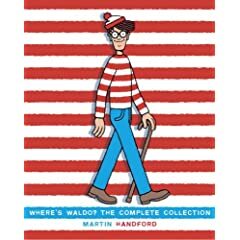 See who can find Waldo and his friends the fastest. For Christmas, we got Timothy the six-pack set ofWhere’s Waldo? books. These are great fun when you want to sit down and relax a bit. There are five main characters to find on every page, which means you can compete to see who can find the most characters. If you don’t want to make it a contest, that’s fine too. It’s fun enough to look for Waldo and his friends together.